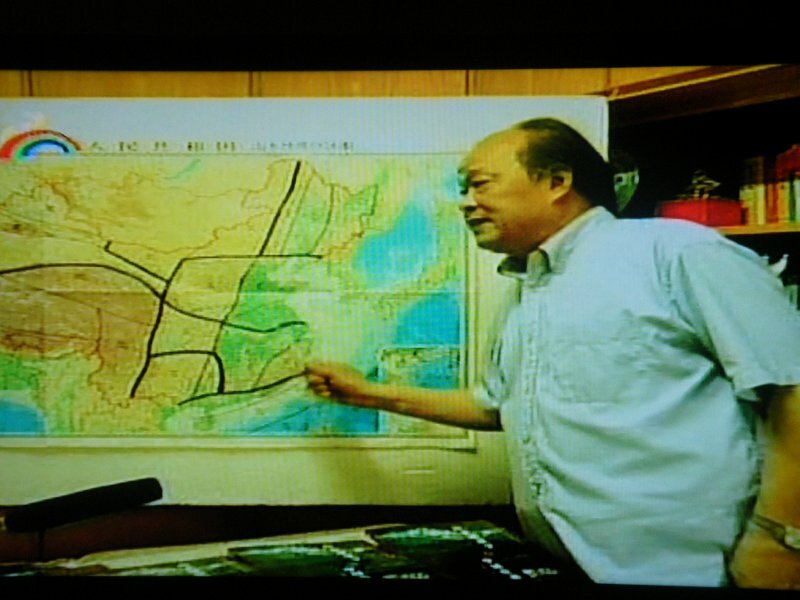 The Caption of Nanjing TV Station's Special Interview "The Pioneer"
Professor Kang Yu-yi, alias Shanyan, also alias Daiyun Shanren, born in Yongchun County, Fujian Province, China in 1937.He graduated from the Geology Department, Nanjing University in 1959, and pursued a teacher career at Nanjing University ever since. He formally acknowledged Mr Xu Gongze as his TCLPteacher in 1965.Prof Kang now works at The Geology Department, Nanjing University as Geology Professor and Art Professor as well. He had once taken charge of Nanjing University Orient Calligraphy and Painting Art Research Institute as vice-chairman, chairman for 17 years. He also have some concurrent posts such as Rock Art Research Association of China Researcher, Resource Person of the Indira Gandhi National Centre for the Arts, India, Ningxia Culture and Art Center professor, Huainan Normal College( Art Department) honorary professor, Fujian Yongchun County Development Advisory Expert Committee chairman. Reporter Yan YI: Ladies and Gentleman, Today we are lucky to meet with Prof. Kang Yu-yi from Nanjing University, so we ask him to talk about the foundation of the Artgeology as a new branch. Yan YI: How do you do! Prof. Kang. Kang Yu-yi: How do you do! Yan Yi: How many years have you been engaged in Chinese painting? Kang: I began to learn painting from my teacher Mr Xu Gongze since 1965, so far it's fully 40 years already. Yan Yi: What's your painting style? Kang: I mainly produce landscape painting, my style possesses the charm of Traditional Chinese Landscape Painting, spirit-resonance life-moving, and contains geological substance. Yan Yi: How your painting differs from others'? Kang: The biggest difference is that I paint according to the Artgeological feature of various tectonic region and climatic region, whereas, an usual painter can not work this way, as he lacks those knowledge. His landscape painting is abundant in characteristics, not only formally like, but vivacious. Thus spirited, because when he is conceiving a landscape painting, understanding the scientific connotation of natural landscape in depth, grasping the formation and evolvement law fo nature landscspe, then pore these into the brush tip and give full play to it, this is incapable for usual landscape painting. This is just what "Kang Painting"'s characteristic is. Yan Yi: You have recently pulished a new book, i.e. Artgeology and Chinese Painting, what do you think about the relevance between Artgeology and landscape painting? Kang: My Artgeology differs from usual landscape painting theories, it adopts scientific matter, with scientific explanation and scientific analyse, dissect scientifically the geological structrue, mountain and river situation, and the spirit incarnated of a region. Because our landscape painting is to express spirit, if there is no spirit incarnated, there is no spirit-resonance life-movement, there is impossible attraction to the audience. Artgeology relate closely to Chinese landscape painting, because the appearance of painting is shape, is spirit, but in the bones is geology, rock and structure and so on, to function, so the two is impartible. Yan Yi: Someone says your book's publication mark a new branch's birth, is that right? Kang: Yes. Because in tha past, although our Chinese landscape painting is 1500-year old, there was no one theoretical article involve the dissection of landscape painting's light-ink stroke and other painting skills with geology. Mr Fu Baoshi from our Jiangsu province, who pays close attention, to what? say, emphatically appeal to painters to paint true mountain and true river. So, he often carry a book of geomorphy in pocket when he is out, and earnestly practise this idea. I was enlightened by him, and had just the ability and the knowledge structrue, and was learning painting. So, I will persist to complete this, I must accomplish Mr Fu Baoshi's incomplete long-cherished wish when live. Since 1985, he boldly combined landscape and geology by investigation of tourist resources, and founded the Artgeology, which started a brand new direction of the tourist scenery painting. After then, upon the solid base of traditional skills study, being a disciple of the nature, he had been devoted to explore various new painting method, strived to reflect in his works all kinds of tourist landscape spot's geological geomorphy features, without losing landscape painting's mood and spirit-resonance simultaneously, for chasing science and artistry's perfect union. Yan Yi: Would you please tell us your main viewpoint? Kang: My main viewpoint is that, say, the geological landscape scene of one place is controlled by six aspects: No 1 is the rock's characteristc, No 2 is the geological structure, No 3 is the climate, No 4 biology, No 5 human being and it's culture, the last one is water --- the special control factor. The climate control factor exists undoubtedly, which include both horizontal and vertical climate zone controls. 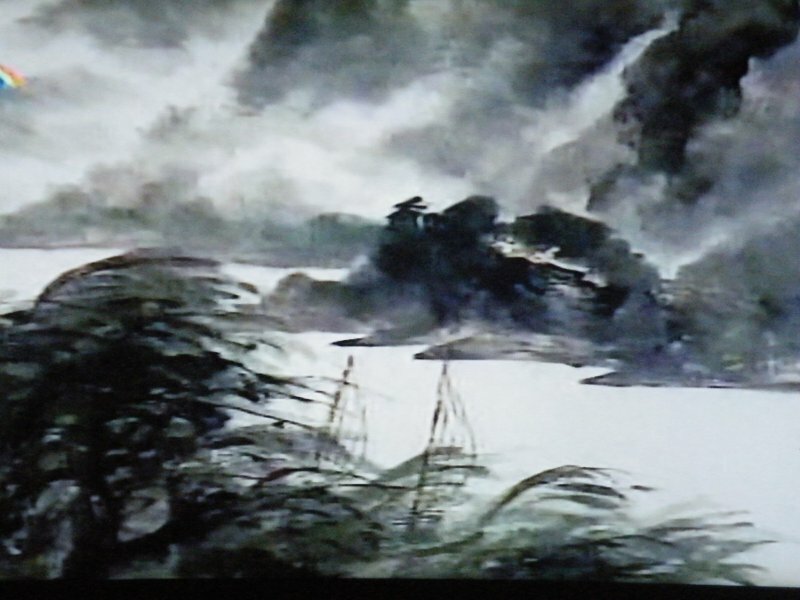 Yan Yi: How to show the climate on a painting? Kang: For example, you are painting Nanjing's landscape, it must be of Nanjing landscape's feature, hills eroded to gentle tumps, with lots vegetation, rocks uncovered. If you are painting the north, the vegetation is poor, rather cold there, more rock is uncovered, but not without a bit vegetation, it's there, so show uncovered rock on moutain, grant alps, with much more rocks. So, this book of mine is to tell art colleges' students, you students must base on different geological structure zones and different climate zones to appreciate natural beauty, to explore living resource in that region, then transform those to your own art. Kang: I've just mentioned that, ought to base on the Artgeological characteristics of different geological structure zones and different climate zones to produce. Why? because our Chinese realm is very vast, the north differs from the south, the east from the west. Look at this "Chinese Artgeological zone graph", you can see, there are eight zones in all, at least eight patterns there, you shall not paint Nanjing landscape to Tibet's, or paint Tibet's to the three Northeastern Provinces', that will eliminate the differences. So, my book's revelation to artists is that, either you are a student or a old paiter, after you have learned this graph, you will know how to paint Sinkiang, rather than using the old method to paint Sinkiang, so this is the very value. Mr Kang Yu-yi, as a geologist who research in study and trudge mountains as well, has the objective condition of "read numerous books","travel long road". However, "paint 10,000-piece of painting" is his persistent sentiment need and pursuing cause as a concurrent artist. Reading makes his painting emit book fragrance, travelling render him fully browse the motherland's majestic mountains and rivers. He is adept at poem and painting, capable both of arts and science, abundant of writings and books on arts and science, integrated all the specialities of a master. Therefore, he have mountians in heart, when passion rise, he swallows clouds and blow out fog, with vigorous and firm paintbrush, contends with nature for grandeur. His landscape painting, magnificent, steep, singular and elegant, as if born refined, opposing the trandition, but conceals deeply the tradition in completely new brush and ink. Reporter Yan Yi from Nanjing TV presiding the interview on June 13, 2005. Yan Yi is questioning Prof. Kang Yu-yi. Prof. Kang Yu-yi is answering the reporter. Prof. Kang Yu-yi is explaining his creative research fruit: China Artgeological zones.